The Helor 240 All-in-One Liquid CPU Cooler from Cougar combines both style and cooling performance into a single package. 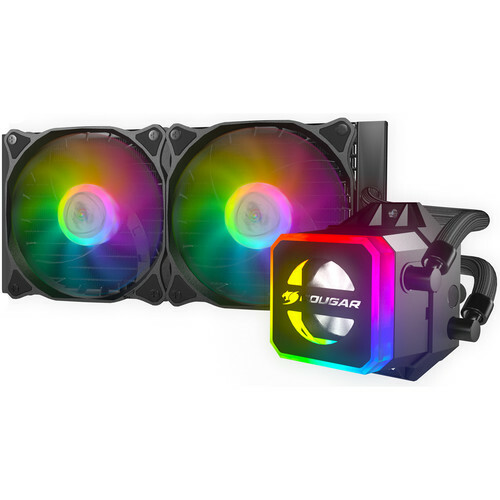 Its CPU block/pump unit and the included 120mm Vortex Omega fans feature RGB lighting, while its 240mm radiator offers plenty of surface area for efficient cooling. The Helor is compatible with a wide variety of Intel and AMD sockets, and can be configured to best fit your cooling and aesthetic preferences. The CPU block/pump unit features a big transparent window, so you can easily check the coolant level. Aside from the CPU block/pump unit, the fans also feature dynamic RGB lighting that you can control using the included Core Box v2 and remote controller. You can also sync your lighting and effects with other components using the 3-pin 5V RGB connector on a compatible motherboard. The included Vortex Omega fans feature longer fan blades for increased cooling. They operate at 600 to 1800 rpm and have a 37.1 dBA rating and a max air flow of 78.4 CFM. Sleeved and extended tubing prevents evaporation and gives you more room to work with. Box Dimensions (LxWxH) 15.0 x 11.4 x 5.6"